This Halloween, Redwings Horse Sanctuary is offering a free evening of spook-tacular veterinary and behaviour talks to help owners overcome the challenges of caring for their horses in autumn. All are welcome to book onto the charity’s latest evening seminar, which will take place at its Aylsham visitor centre, north of Norwich, on Wednesday 1st November from 6.30pm. Senior Veterinary Surgeon, Nicky Jarvis will be taking the fright out of the scary topic of Equine Atypical Myopathy – a disease most commonly diagnosed in autumn and caused by the consumption of a toxin found in the leaves, seeds and seedlings of Sycamore and Box Elder trees. 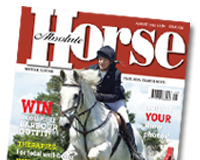 Nicky will be sharing essential information on the symptoms and treatment of Atypical Myopathy and how to protect your horse from this devastating condition. Meanwhile, Equine Behaviour Manager, Sarah Hallsworth will be explaining how to manage so-called ‘spooky’ horses and how to prevent and reduce fearfulness in horses. They’ll also be plenty of advice on how to help your equines cope with the stresses of nearby firework displays as Guy Fawkes approaches. Attendees will also be able to discover what creepy crawlies may be lurking in their own horse’s muck! Veterinary nurses will be providing a live demonstration of a faecal worm egg count and testing as many samples as possible brought in on the night, as well as giving their top tips on worming welfare. Further details about what makes a suitable sample will be given upon booking.